Stocks of frozen poultry meat in cold storage increased 1.7% from November 1, 2017, to 89 861 tonnes on November 1. This increase comes mainly from Ontario, where stocks of frozen poultry meat in cold storage were 42 073 tonnes, up 10.3% from the previous year. 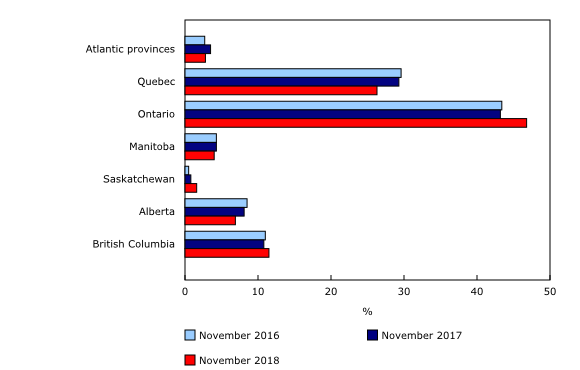 Ontario continued to hold the largest share of frozen poultry meat stocks, accounting for 46.8% of stocks on November 1, 2018. In October, placements of hatchery chicks on farms increased 1.2% compared with October 2017, to 71.3 million birds. Over the same period, placements of turkey poults decreased 1.0% to 1.6 million birds. Egg production rose 2.7% from September 2017 to 66.7 million dozen in September, continuing its steady growth on a year-over-year basis. Ontario (36.7%) and Quebec (20.6%) had the highest production of eggs. 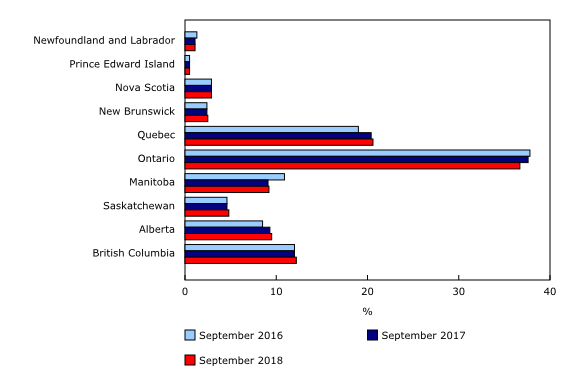 Poultry and egg statistics are available for Canada and the provinces. Data on stocks of frozen eggs and poultry meats as well as edible dried egg products are available for November 2018. Data on the placements of hatchery chicks and turkey poults are available for October 2018. Data on egg production are available for September 2018. These data are subject to revision.